The array of elements consists of the raw data values that a user wishes to store in HDF5. The supporting metadata describes that data. The metadata is stored in the dataset (object) header of a dataset. See the H5Pset_layout/H5Pget_layout APIs for details. If the storage layout is contiguous, then the raw data values will be stored physically adjacent to each other in the HDF5 file (in one contiguous block). This is the default layout for a dataset. In other words, if you do not explicitly change the storage layout for the dataset, then it will be stored contiguously. Chunking is required for enabling compression and other filters, as well as for creating extendible or unlimited dimension datasets. It is also commonly used when subsetting very large datasets. 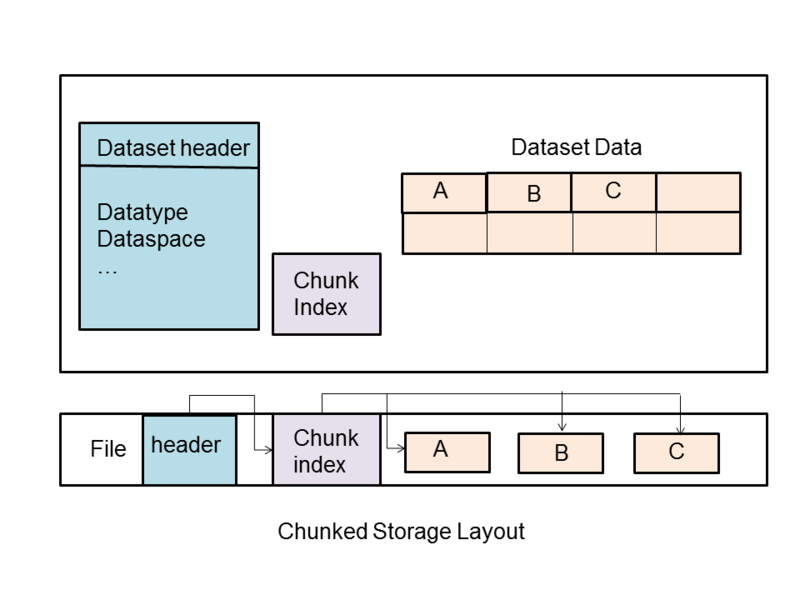 Using the chunking layout can greatly improve performance when subsetting large datasets, because only the chunks required will need to be accessed. However, it is easy to use chunking without considering the consequences of the chunk size, which can lead to strikingly poor performance. Note that a chunk always has the same rank as the dataset and the chunk's dimensions do not need to be factors of the dataset dimensions. If a very small chunk size is specified for a dataset it can cause the dataset to be excessively large and it can result in degraded performance when accessing the dataset. The smaller the chunk size the more chunks that HDF5 has to keep track of, and the more time it will take to search for a chunk. An entire chunk has to be read and uncompressed before performing an operation. There can be a performance penalty for reading a small subset, if the chunk size is subtantially larger than the subset. Also, a dataset may be larger than expected if there are chunks that only contain a small amount of data. A chunk does not fit in the Chunk Cache. Every chunked dataset has a chunk cache associated with it that has a default size of 1 MB. The purpose of the chunk cache is to improve performance by keeping chunks that are accessed frequently in memory so that they do not have to be accessed from disk. 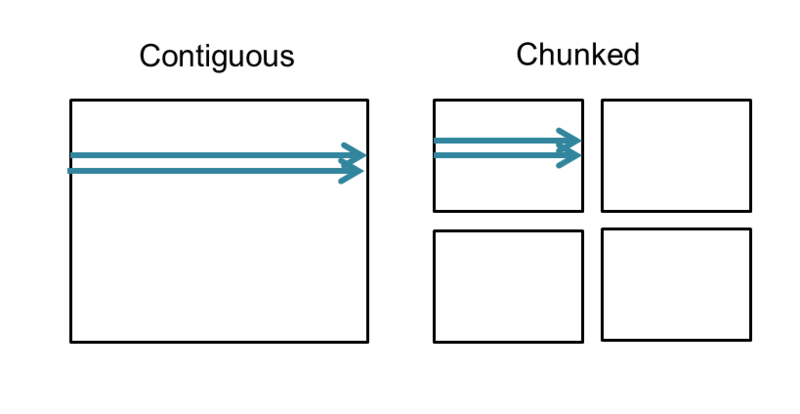 If a chunk is too large to fit in the chunk cache, it can significantly degrade performance. However, the size of the chunk cache can be increased by calling H5Pset_chunk_cache. Avoid very small chunk sizes, and be aware of the 1 MB chunk cache size default. Test the data with different chunk sizes to determine the optimal chunk size to use. Consider the chunk size in terms of the most common access patterns that will be used once the dataset has been created. 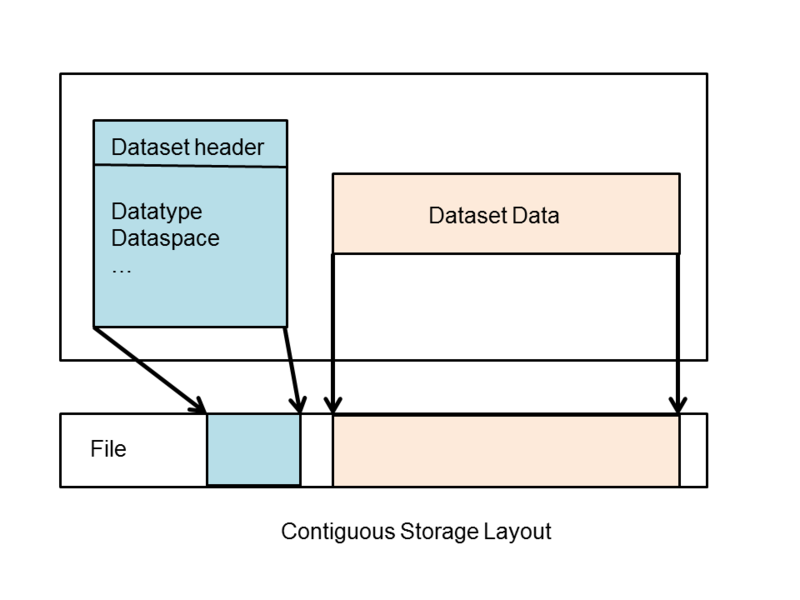 A compact dataset is one in which the raw data is stored in the object header of the dataset. This layout is for very small datasets that can easily fit in the object header. The compact layout can improve storage and access performance for files that have many very tiny datasets. With one I/O access both the header and data values can be read. The compact layout reduces the size of a file, as the data is stored with the header which will always be allocated for a dataset. However, the object header is 64 KB in size, so this layout can only be used for very small datasets. For example code, see the HDF5 Examples page. Specifically look at the Examples by API. There are examples for different languages. The dataset layout is a Dataset Creation Property List. This means that once the dataset has been created the dataset layout cannot be changed. The h5repack utility can be used to write a file to a new with a new layout. See "Properties and Property Lists" in the HDF5 User's Guide.